Pizza Stones Make Home Made Pizza Great! 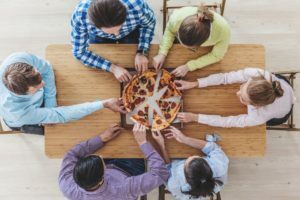 Pretty much everyone loves pizza, but if you follow certain types of diets or have certain food allergies or intolerances, you may not be able to eat pizza dough that is made with yeast. So, does this mean that you can never enjoy pizza again? No, it does not. There are many other ways that you can enjoy pizza dough, and no yeast is needed. Yes, it is normally what is used to make the dough rise, but there are other alternatives. 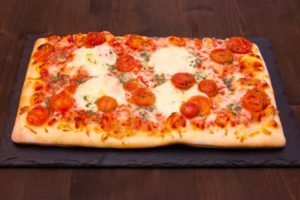 We are going to take a look at the three different types of yeast and how to make pizza dough without yeast and also give you a pizza dough recipe that uses no yeast at all. First of all, what is yeast? Scientifically speaking, it is a single-celled organism known as fungi. It needs food (starch and sugar), warmth, and moisture to thrive. It turns food into carbon dioxide, as well as alcohol when it is fermented. It is also used to make breads and other baked goods rise. There are three types of yeast: baker’s yeast; brewer’s yeast; and nutritional yeast. When the fungi is dried at low temperatures, it thrives, and it becomes baker’s yeast. This is the type of yeast that would normally be used to make pizza dough, because it is a leavening agent. This is made from the pulverized yeast cells, and is a by-product of brewing. The cells are pulverized at very high temperatures, creating a bitter-tasting yeast that is a good source of potassium, calcium, phosphorus, B vitamins, amino acids, and chromium. This is grown in molasses, as a nutritional supplement. It has a nutty, cheesy taste that is somewhat sweet. It is made through high temperatures, and is a source of many vitamins, minerals, and other nutrients. Can Vegans have Yeast in their Diets? So, can vegans eat yeast? It all depends on the type of yeast. Unfortunately, the type that they can’t eat, baker’s yeast, is the type that is used to make pizza dough and other baked goods. Baker’s yeast is a living organism, and therefore, many may not think that it would be part of a vegan diet. But, don’t forget that veganism is about healthy living, and keeping animals and other organisms from suffering. Yes, yeast does have a nervous system, but it is not something that feels any pain, even if it is killed. So, yeast is vegan-friendly. But, baker’s yeast is going to be more of a no-no than brewer’s yeast or nutritional yeast, because it is alive and active whereas the others are not. When it comes to eating yeast on a vegan diet, nutritional yeast is generally recommended. It has a lot of nutritional value, and it adds a lot of flavor to many of your dishes, which is important for vegans as they don’t always have a lot of flavorful choices. It actually adds a bit of a cheesy, nutty flavor. So, where does this leave pizza lovers? As we already mentioned, traditional pizza dough is made with yeast. Without the yeast, the dough isn’t going to rise, and you will have flat, tough pizza crust. In order to make regular pizza dough, the yeast needs to be activated with warm water, and a bit of sugar also helps the process along. The activated yeast is what makes the dough rise, and this is how you get a thick pizza crust, which is great for deep-dish pizza lovers. 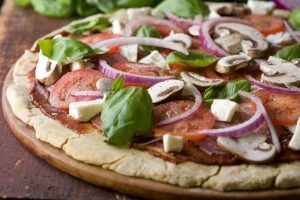 While it is not completely forbidden for vegans to eat pizza, there are alternatives that are going to be much more vegan-friendly. Now we are going to prove to you that you can have a delicious, thick pizza crust without using any yeast whatsoever. 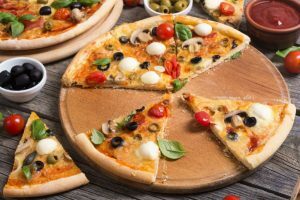 Of course, if you are vegan or are preparing the pizza for vegans, you are also going to have to make several substitutions for your toppings, and no cheese is allowed. To make the dough rise, you are going to substitute baking soda and lemon juice for the yeast. Check out this delicious recipe. Preheat the oven to 425° Fahrenheit. In a large mixing bowl, preferably glass, combine flour, lemon juice, baking powder, water, salt, and vegetable oil. Mix all of the ingredients with a fork, and then get your hands right in there to knead the dough into a ball. If the dough is too stiff, you can add a bit more water, and if it is too sticky, you can add more flour. Once the ingredients are thoroughly mixed, flour a bread board or counter to create a non-stick surface. 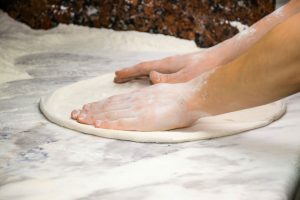 Place the dough on this surface, and begin kneading for about five to 10 minutes. The dough should be soft without feeling sticky. If it is sticky, you can add a bit more flour, but do so in very tiny amounts until you achieve the desired texture. The dough should be springy. 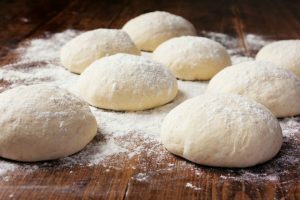 Unlike traditional dough made with yeast, there is no need to let this dough rise before turning it into a pizza. You can immediately spread the dough out onto your favorite pizza pan, flattening it out with your fingertips as it spreads. After you have the dough spread onto the pan, brush it with the extra virgin olive oil. Now you are ready to add your favorite pizza toppings. If this is a vegan pizza, remember to not use any cheese. A vegetarian pizza can have cheese, but no meat toppings. There are lots of delicious vegan/vegetarian toppings you can use, including mushrooms, peppers, and pineapple. This dough takes longer to cook than traditional yeast dough. Once your pizza is prepared, bake it for about 45 minutes to make sure that the dough is fully cooked. 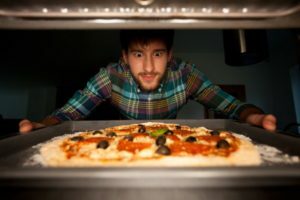 How to Make Homemade Pizza with Store Bought Dough Best Bread Machine Pizza Dough Best Pizza Dough To Buy: Which One is the Best? 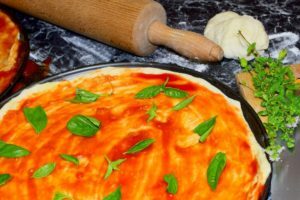 « Pizza Sauce Vs Pasta Sauce: What’s The Difference? 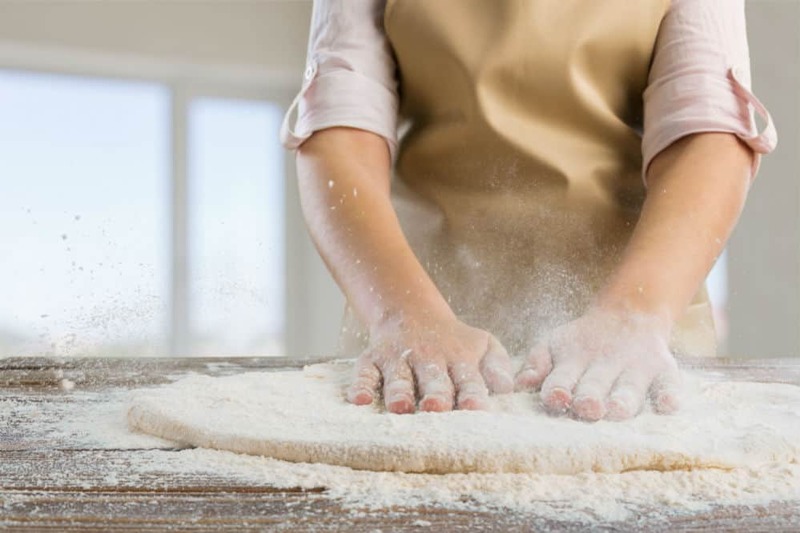 » How Long does Pizza Dough Last in the Fridge? How Long does Pizza Dough Last? How Long does Pizza Dough Last in the Fridge? Some recommended products may use affiliate links. 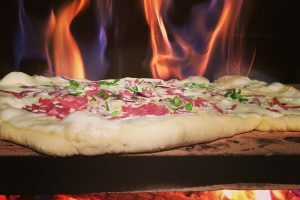 amazinghomemadepizza.com is a participant in the Amazon Services LLC Associates Program, an affiliate advertising program designed to provide a means for sites to earn advertising fees by advertising and linking to Amazon.com.